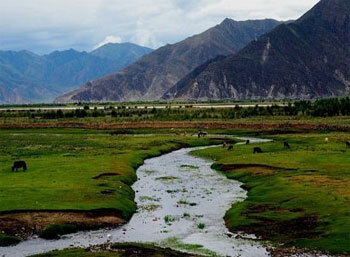 Gyama valley is a broad agricultural tributary of the Kyi Chu river, situated to the east of Lhasa. Barley fields sprawl across this valley floor, which is splendid with small villages, settlements and temples, including the shrine commemorating the birthplace of Song Tsen Gampo. It will be 4 days walk from Gyama to Samye and is one of the finest treks in central Tibet. After visiting Samye Monastery, we will trek across Yarlung Tsangpo River and drive to Tsetang. The next morning we will go to Lhasa.. From Lhasa, we continue our journey by driving to Tashido near Namtso Lake and camp there for one night. From Namstso Lake it will take 3 days to trek to the town of Damshung via the Kong-La pass, a route that is simply unforgettable. Day 01 : Fly To Gongar.Transfer to Lhasa, Check in to Hotel. Day 02 : AM: Guided tour of Potala,the Winter Palace of Dalai Lama. PM: Guided tour of Jokhang Temple and Barkhor Market. Day 03 : AM: Guided tour of Drepung, biggest Monastic University of Tibet. PM: Guided tour of Norbulinka, the Summer Palace & Sera Gompa. Day 04 : Drive to Gyama, enroute visit Ganden Monastery Over Night Camp. Day 05 : Arrange the Yaks and trek to Thocha Over Night Camp. Day 06 : Trek over the Tsepla Pass. Over Night Camp. Day 07 : Trek to Yarmalung, the (Retreat Centre) Over Night Camp. Day 08 : Trek to Samye and Visit the Monastery Over Night at Guest House. Day 09 : Drive to Tsedang via Mindroling Monastery Over Night at Tsedang. Day 10 : Explore the Yarlung Valley,Yumbulakhang the first Castle built for Tibetan King and Trandruk Temple.